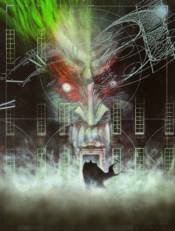 One of the greatest Batman stories ever told, BATMAN: ARKHAM ASYLUM is celebrated in this 25th Anniversary Deluxe Edition, offered simultaneously as both a Deluxe Edition hardcover and a new edition trade paperback at DC's standard trim with a new cover by Dave McKean! The inmates of Arkham Asylum have taken over and are demanding Batman in exchange for their hostages. Accepting their demented challenge, Batman is forced to endure the personal hells of The Joker, Scarecrow, Poison Ivy, Two-Face and many other sworn enemies in order to save the innocents and retake the prison. During his run through this absurd gauntlet, the Dark Knight's must face down both his most dangerous foes and his inner demons.